There’s a bit too much boom for your buck packed into this otherwise clever post-audio dock gadget. ACCORDING TO A number of audio industry folk that I’ve spoken to in the last couple of months, the audio dock is on its last legs. Any manufacturer making a mass market speaker system that’s been designed to have an Apple device docked into or onto it is living in the past – the future, and the present for that matter, is wireless, and the source of choice is a smartphone. 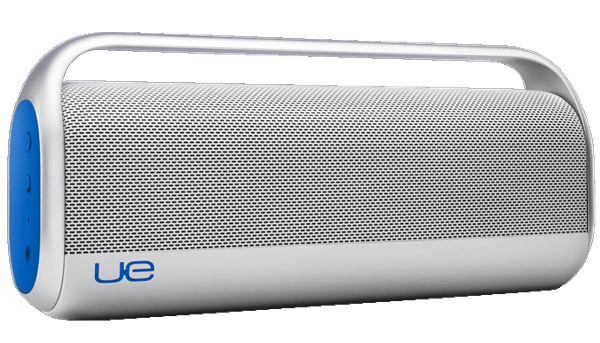 Which is where products like Logitech’s UE Boombox come in. Like Sony’s SA-NS510 speaker system (reviewed here), the Boombox is both portable and wireless. Instead of going down the Wi-Fi Airplay route, the Boombox keeps the connectivity options simple – there’s a 3.5mm input for old school types, but the bulk of users will just hook up their devices using Bluetooth. In fact, the Boombox can have three devices connected simultaneously (although only one can play music at a time) so users can switch device as they choose. Which is perfect for a dinner party or BBQ environment, for example, but if your friends have dubious taste in music, then you might not appreciate this feature all that much. There’s no display or connection indicator light, but the Boombox plays a certain noise on power on or off and another one when it connects to a Bluetooth device. Pairing was easy every time, the Boombox was quick to link up to previously paired devices and the range was about right for a Bluetooth system. The Boombox’s sculpted aluminium body is well put together, the low profile integrated carry handle is comfortable and the unit looks really attractive with the blue logo and side-panels, so Logitech has nailed the minimalist styling of the unit. The left side-panel is home to the 3.5mm input, power socket, on/off switch and a Bluetooth connect button. The entire right side-panel acts as a volume control. Battery life is claimed to be around six hours, and that proved to be about right. That doesn’t sound like a lot of run time but it should just about suffice for most gatherings, and in any event, the Boombox can just be left plugged into its wall-wart power supply if it needs to play for longer periods. Missing in action is some kind of carry case to protect the Boombox while it’s being transported around, but even a soft sleeve would do the job. For a compact speaker system, the Boombox sure does pack in a lot of drivers. There are no less than eight speakers in there – two 0.5-inch tweeters, two 3-inch woofers and four 2 5/8-inch passive radiators. The claimed frequency range is 55Hz – 20kHz, and that’s almost believable. Actually, it was too believable at the bottom end. I’m used to the big, yet tight bass of Ultimate Ears earphones, having owned a set since 2007, but I was surprised that the UE (the new branding for Ultimate Ears in the Logitech stable) engineers had built quite this much bass into the Boombox. Put it this way, the 40kg, metre-tall, $15,000 ATC SCM20SL AT active loudspeakers that I had in for review at the same time as the Boombox are listed as having a low frequency extension of only 60Hz (at -6dB), so theoretically, the Boombox reaches lower. However, ATC is concerned with bass linearity and quality, so every single Hz emanating from the SCM20SL AT’s is as tight as anyone could possibly hope for. On the other hand, with certain music, the review Boombox boomed like a large, loose kick drum; so much so that I asked for another sample, which proved to be much the same. It appears that a peak has been engineered into the lower part of the Boombox’s low end to give it some weight down at the bottom. In addition, experimentation revealed that just like Sony’s SA-NS510, the Boombox is sensitive to its placement in a room; in this case the bipolar speaker layout means that the Boombox is prone to picking up bass reinforcement from nearby walls. It also really doesn’t like being located on hollow objects such as chests or drawers. I had to move it around the house to find positions that caused the least bass-boost and once properly placed, the boom of the Boombox was brought under control to a degree, although it was never as tight or as fast as I would have liked. At high levels, I was often tempted to turn the volume down, especially on tracks that had a good dose of low frequency power right in the middle of that bass peak. The upper bass, midrange and treble were really impressive for this type of portable speaker, conveying levels of transparency and detailing that were quite unexpected. The treble is well extended, which adds to the overall sense of clarity. The overall balance is quite warm, much like the UE 6000 ‘phones that I was testing at the same time as the Boombox. With certain tracks, the Boombox sounded like a more expensive unit than it is but with others, the bass got in the way. There’s much talent in the Logitech UE design labs and that’s evident in much of the styling and performance of the Boombox. Sometimes however, less is more, and the Boombox would have been a better speaker system if its designers had accepted the limitations of the form factor and lopped 10Hz off their low frequency extension target. I know why this unit has been designed this way – it’ll sound impressively powerful, with loads of deep bass in-store, which means it’ll sell by the truckload. Also, a certain demographic is going to love the sound. I just wonder if some buyers are going to end up frustrated once they get it home?